We knew Day 6 was going to be a long drive. From Gibbs Farm we had to climb back up to the rim of Ngorogoro crater, around the rim, and through the dry highlands of the extended Ngorogoro Conservation Area (where the Maasai graze their herds and live in isolated boma, clusters of mud/stick homes) to reach the grasslands of Serengeti. Although the map indeed indicates this is a main road, and signs refer to it as a highway, it is a dusty two-lane dirt road that treats you to 100km of washboards. I was glad to have skilled drivers at the wheel; Robert and Freddy zipped along at a steady pace as we rounded steep corners and avoided oncoming overstuffed public buses or transport trucks, skillfully avoiding the worst of the potholes and boulders that pop-up in the road from place to place. The sight of four dejected men sitting beside a new rover that had, perhaps an hour before, rolled over and over after they had misjudged a turn, reaffirmed the challenges one could face if one attempted to self-drive a safari through this countryside. Oldupai Gorge – not much to look at, but a fascinating history. We made a welcome stopover at Oldupai Gorge. Although non-descript when approached from the road, or even as you look over the dusty gorge whittled by millennia of water cutting into the plains, it is one of the single most important scientific sites in the world. Indeed, the day of our visit was the 56th anniversary of the breakthrough discovery, by Mary Leakey in 1959, of the 1.75 million-year-old remains of early hominids. 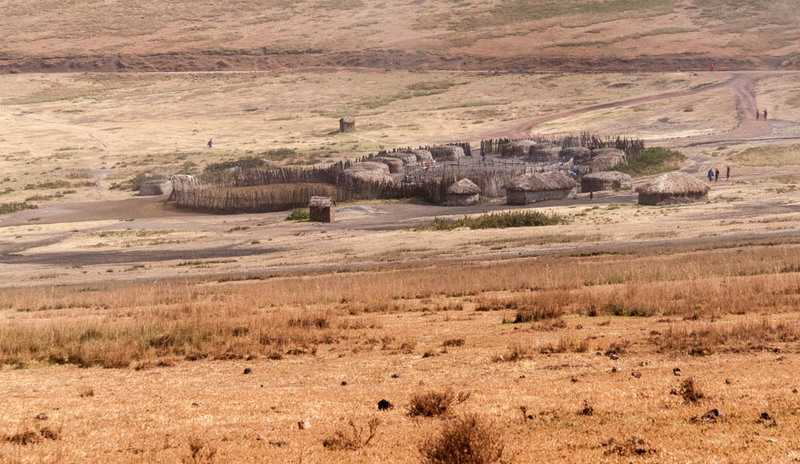 Sometimes called the “cradle of mankind”, Oldupai has revealed fossils of Homo habilis, Homo erectus, and Homo sapiens. Sitting at the observation station, looking across the gorge at the science research station and down at the active research plots, the timeline of human evolution was immediately palpable. What an amazing opportunity to visit such a place. 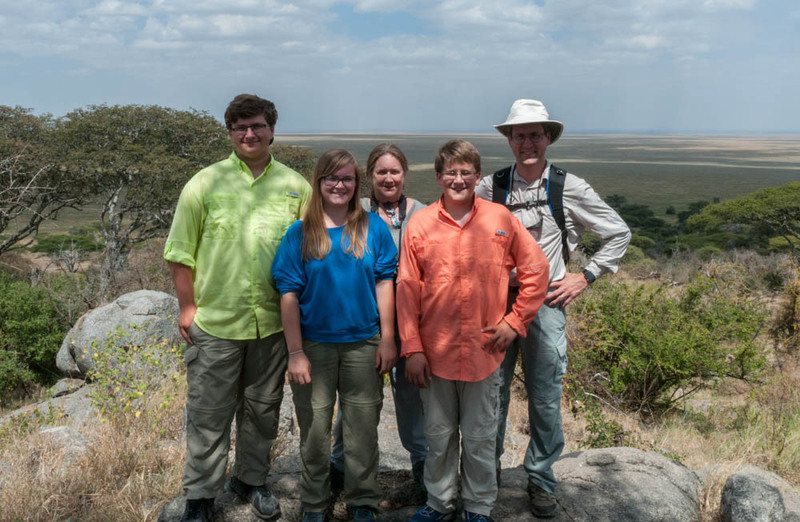 Family photo atop a kopje at the entrance to the Serengeti. An hour further down the road we crossed the border into Serengeti National Park. The border is a non-descript line on the map, completely invisible on the actual landscape. There is no fence, sudden change in vegetation, or ugly gateway community like one often sees outside major U.S. parks. The savannah simply stretches as far as the eye can see, a boundary-less landscape across which millions of mega-fauna migrate annually. 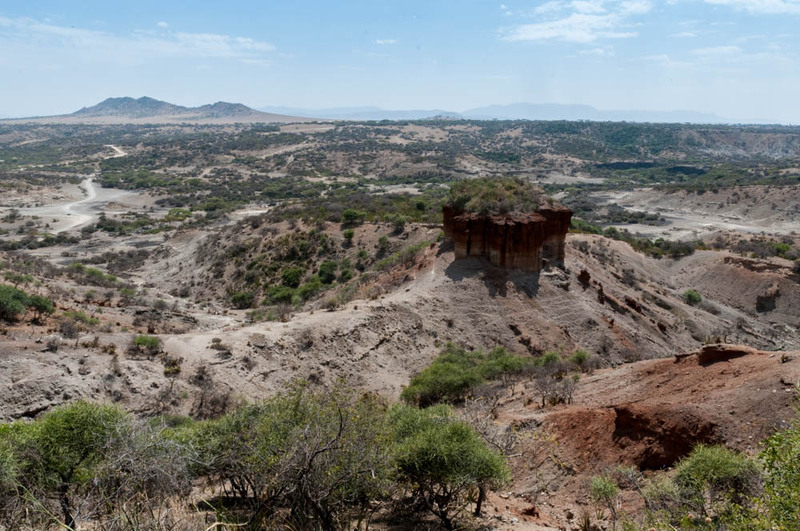 An oasis formed around a kopje (a small hill of granite, the eroded remnant of a once-underground intrusion of lava into the metamorphic plains that now form the Serengeti) marks the official entry to the park. 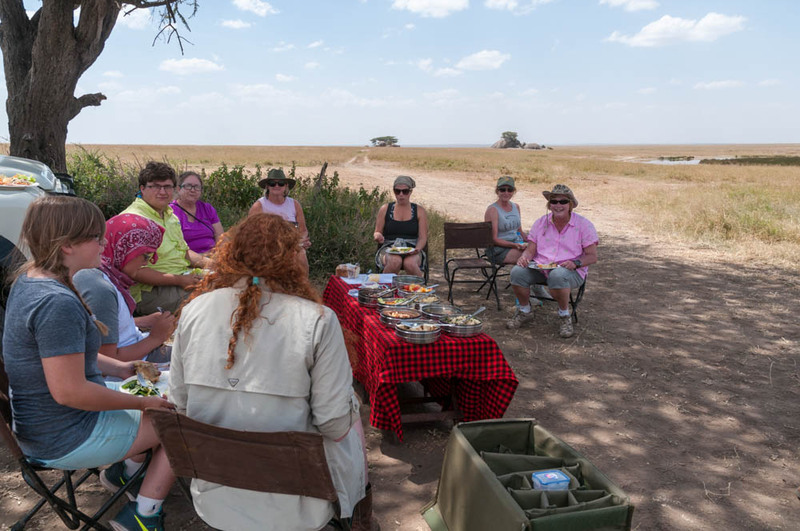 We nibble our lunches and take photos from the top of the kopje while our guides handle the necessary paperwork. Once inside the park, we leave the main road (which, though itself a dirt road barely two cars wide is nonetheless a major cross-country route for buses and cargo trucks) to explore some of the looping tracks that wind through the savannah and around other kopje. We get our first good look at hartebeest, the largest of the antelope species, and pass herds of zebra and Thomson gazelles grazing lazily among the tall grasses. A leopard’s tree cache of Thomson gazelle; Serengeti N.P., Tanzania. Soon, though, we come across a treat, obvious from the collection of other rovers parked along the road, their occupants peering into a solitary tree alongside the road. 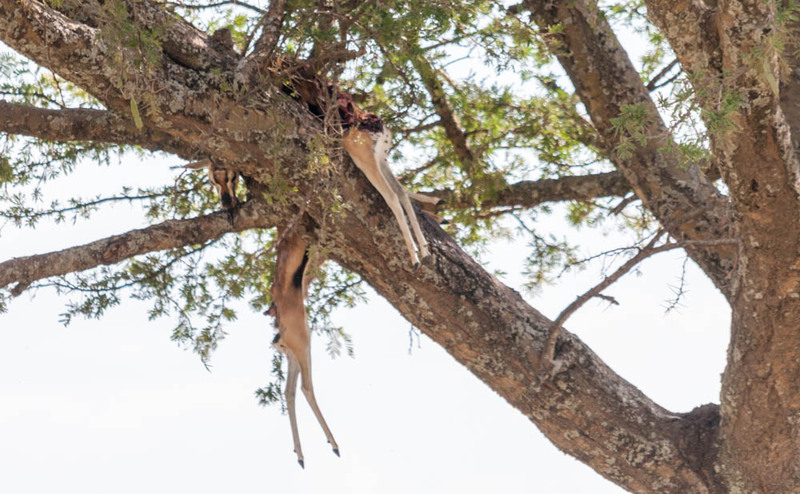 I notice a stiff pair of legs dangling from the lowest branches of the tree – the legs of a Thomson gazelle, in fact. (It may be worth noting that gazelle do not climb trees; yes, they can run fast – very fast – but not fast enough to find themselves in a tree. 🙂 On closer examination I find the leopard resting further out on that branch, and her cub resting on another branch. And, over time, a total of five dead Tommies cached in various crooks of the tree branches. Leopards are strong climbers; they catch and cache their food for later, unlike cheetah and lions that must eat what they can before other scavengers take over. We later come across a group of eight lionesses, sleeping under another tree. With no male in sight, and their afternoon agenda apparently limited to more sleep, we leave them be and move on westward across the park toward our next nyumba, just beyond the western border of the park. Main buildings at west-central nyumba, Serengeti N.P., Tanzania. 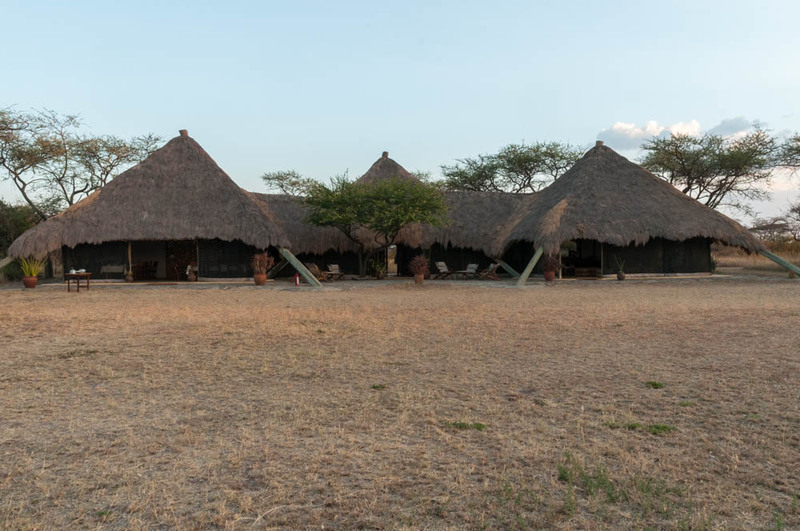 This nyumba has a permanent central lodge made of strong poles and a thatched roof, with tents similar to our prior nyumba. It is a beautiful location with long-distance views and great sunsets. Awaking to Day 7 with the pre-dawn sound of hyena, lions, and wildebeests, I venture out (but not too far out) to photograph the sunrise. We are up early, and out early, to spend another day in the Serengeti. What a day! 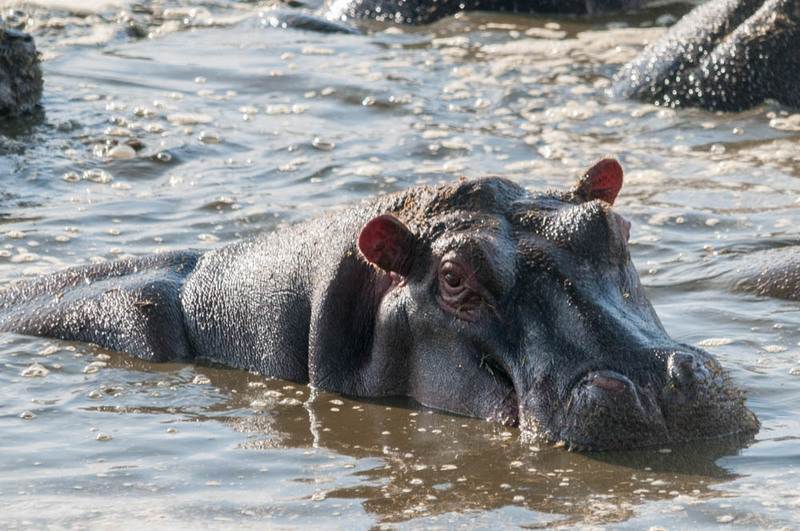 Barely into the park we pass a herd of migrating wildebeest, a crocodile, a group of hippos, and many interesting birds. We stop, though, when we encounter a group of very excited hyenas – perhaps a dozen. Robert stops, expectant, because such excitement probably means something else is going on. Sure enough, after a minute of exploring the surrounding grass with binoculars, we see the two lionesses. Moments earlier, they have taken down a zebra, and are just starting to dig in for their morning meal. Periodically, the lionesses raise their heads to look at the hyenas, and the strange metal vehicles accumulating on the nearby roadway, their faces bloody from their meal. Some of the hyena approach carefully, remarkably close, waiting their turn but ensuring they will be first if and when the lionesses decide to leave. Vultures begin to circle, and some begin to land among the hyena, waiting their turn. A lioness pauses while eating her kill, Serengeti N.P., Tanzania. One of the lionesses rises and departs, walking away from us. Robert is sure that she has gone to fetch her cubs so they can share in the meal. [We later learn that she has indeed brought two cubs back toward the kill, close enough for the other Thomson group to have seen them!] The remaining lioness stays to eat, and to defend the meal from the anxious and aggressive hyena. Eventually, she decides that there are simply too many hyena – perhaps 15 or more, now – and she leaves before the first lioness can return. Moments later, the hyenas move in, starting a feeding frenzy. Some vultures try to partake, but are swatted away by the hyena. One of the hyena makes off with a big piece of the zebra’s back leg; the others make no move to stop her, so Robert deduces she must be a matriarch. She disappears into the grass with her prize, and comes back 10 minutes later without it; we speculate that she left it with her cubs. Others have begun to notice. An eagle and a Maribu stork land and start negotiating the pecking order. As the hyenas reach their fill, they wander off and the birds move in, taking their turn. Within hours, little or nothing will remain. (Indeed, we came back later in the day and saw no animals at the site.) Check out the photos. 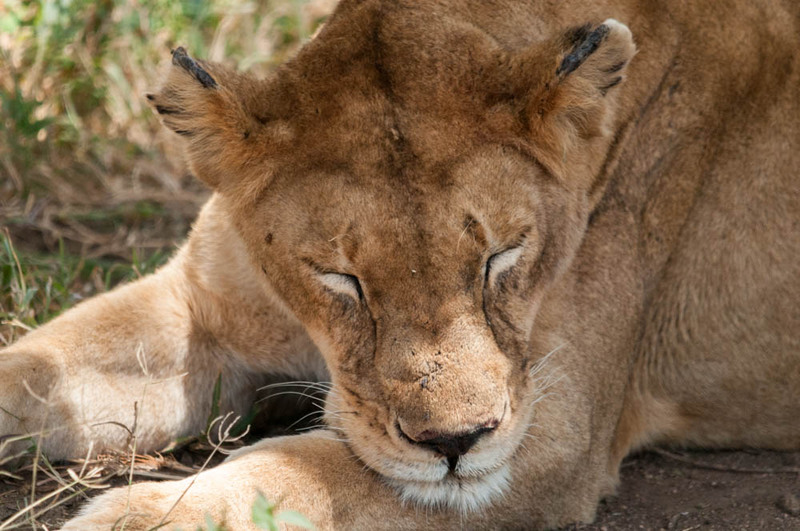 Lioness dozing; Serengeti N.P., Tanzania. We move on to explore several kopje in search of big cats. We find a sizable group on one kopje, including a male lion on the highest rock surveying his territory, while another shady rock forms a comfy resting place for a group of lionesses and juveniles. Robert notes that we are passing through “good cheetah country”. Sure enough, under a solitary tree, we find a cheetah and two cubs – though very hard to see as they snooze in the tall grass under the tree. We watch for a while and decide to visit them again later in the afternoon. We stop at an isolated tree, a few hundred meters from lions we had passed earlier. Robert gets out to investigate and tosses a stick into the grass at the base of the tree, declaring the surroundings clear of lions and other sharp creatures. Soon the guides have laid out an impressive picnic, with 8 different dishes, ceramic plates and real silverware, and folding chairs for everyone. This is truly luxury camping! A cheetah trots off to hunt gazelle. Back to the lions and cheetah after lunch. The cheetah are more visible, now, though still resting in the grass. Our group are the only ones present. 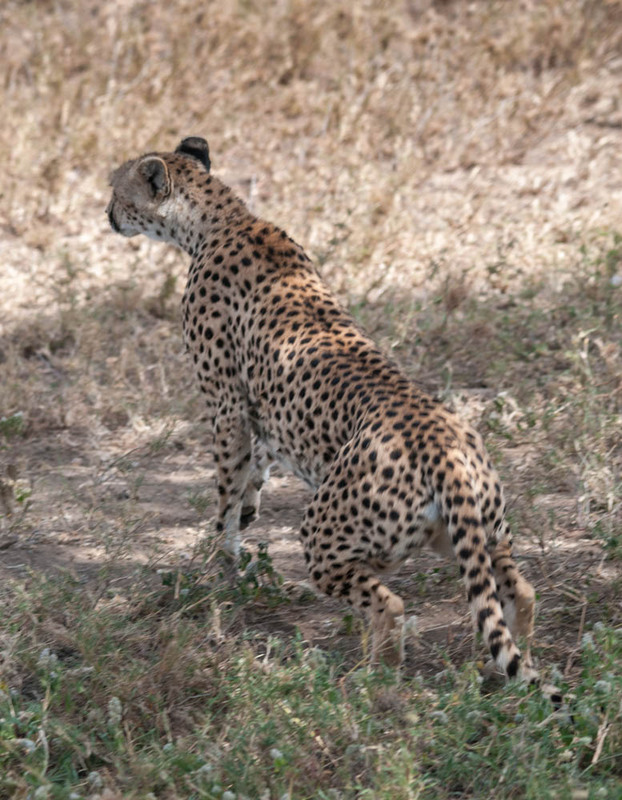 We watch, snapping photos every time the cats shift position; suddenly, I note that momma cheetah is up! She lopes slowly away from the tree, not making a noise. The cubs follow. We follow her gaze and see a small group of Tommies crossing perpendicular to her path, less than 100m distant. She creeps around a termite mound, slightly crouched. Suddenly she bursts forth at full speed, passing two of the Tommies and catching a third, all within maybe 20-30 meters. The cubs are on an intercept course, arriving slightly after she has taken down the Tommie. She steps aside to rest – such bursts of speed take tremendous energy – and leaves the kill for the cubs to eat. She rests, and looks away from the cubs and the kill, watching for others that might come steal the kill. Wow. Even the guides, jaded by years of experience, are thrilled to have seen a cheetah kill, a very rare opportunity. Some scientists come and wait for months before they see something like that, emphasizing just how lucky we are. Check out the Smugmug gallery. Day 8 had us crossing the Serengeti from the west gate, heading across the savannah and climbing to the higher, rolling hills of the northeast. 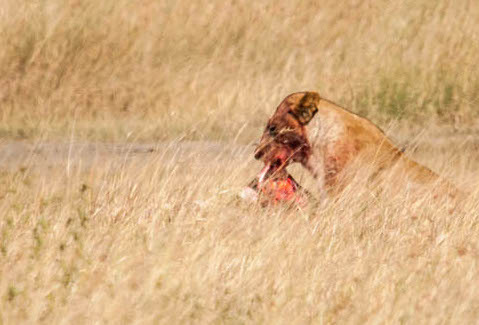 We found several groups of lions – including another mating pair seemingly oblivious to the tourists spying on their private business – and crossed the border and into Maasai territory. Here the border is more noticeable, as we immediately passed through herds of grazing cattle and goats, then cultivated fields of corn and grains, and finally small villages. We were heading for Enashiva, a wildlife preserve owned and operated by Thomson Safaris.